We had left Valencia behind us on route A-3 and were headed north onto the plateau of the Sierra de Tejo then on to Requena. The Opal Astra felt good. The Astra is not exactly my idea of a sport sedan, but after a couple of weeks of the metro, city buses and planes, the Opal might have as well been a BMW. The manual transmission was a nice bonus and the car gleefully worked its tail off to keep us over 80km/h, up the steady inclines, past red pastured farms and Roman ruins, over olive groves and vineyards. When it had the occasional chance to coast through the foot hills, it slid silently through the valleys and cornered like slot car. It felt like freedom to drive again, to be in charge of our own schedule. It was a nice change. While I drove Mama read a brief history of Requena, Spain, to our teenagers in the back. I listened in and out, already multitasking between driving and adsorbing a beauty both foreign and familiar. I had read most of it two nights before anyhow. The region is called Utiel-Requena. It has an ancient association with wine and humanity and has been inhabited since the 7th century BC. There is some evidence that grapes have grown in the region since at least the 5th century BC. Ancient Romans are thought to have settled the area before the Common Era; local mythology has it they came for the grapes and wine. As early as the 14th century AD Utiel-Requena had been established as an important Spanish wine producing area and currently it produced the second largest amount of red wines in Spain. That was all cool, but we weren’t going for the wine. 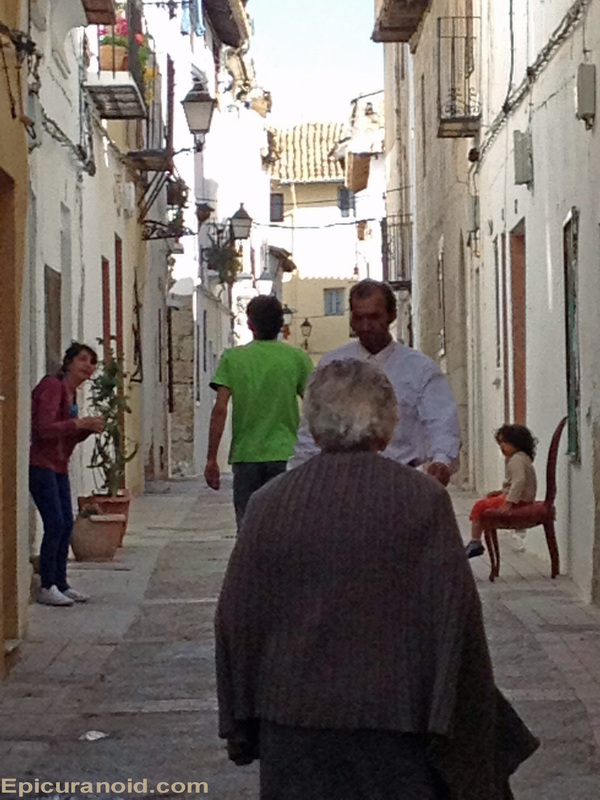 La Villa is a plus or minus ten century old hilltop neighborhood in Requena with streets as wide as hallways. The Moors built a citadel there which still stands today. A medieval wall encircles La Villa. All of the buildings that have been built with their backs into that wall have preserved its original shape and even in some places the ancient wall itself. If the citadel was not enough to call a visitor up to La Villa, within the walls are also two 14th century Gothic churches and a palace attributed to Spain’s national hero, El Cid. It was all really cool, but we weren’t going to Requena for the history. The attraction started the day we arrived in Valencia. The couple we rented our apartment from met us at the airport and took us to our temporary home in Ruzafa, one of Valencia’s oldest neighborhoods. In explaining the endless open air “thrift” markets – a result of the recession – they touched on the fact that Requena had a great market on Saturdays and we could get there by train in about an hour. 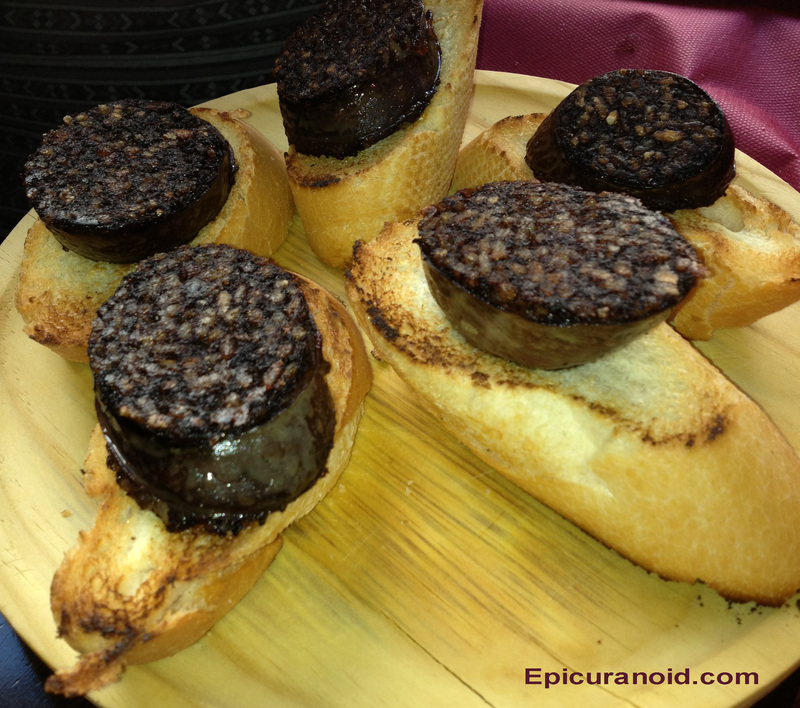 And they added, “They have a medieval walled city, excellent wines, and they are highly regarded sausage makers too”. We talked a lot and when they were leaving us I asked them to remind me of that place with the Saturday market. I wanted to write it down. “You don’t have to,” they said, “It’s on the label of the bottle of Cava we chilled for you in the fridge.” With that they were gone and we enjoyed a chilled bottle of Cava Senorio de Requena, Brut. It was delicious so we took notice for the future. Wines from Utiel-Requena are ubiquitous in Valencia and we tried many, so the name stayed fresh with us. We were thinking of the market and a trip through the country I guess, but it became a goal to visit for whatever reason, and more and more we keep hearing the word “Requena”. I’ve been spoiled by good Spanish food and by some great restaurants in Madrid and San Sebastian. In Valencia it was the same. While the local food may have been slightly more common in Valencia, the hospitality was extraordinary. On more than one occasion a tapas bar owner went out of his way to make our American family feel at home and well fed. Even when we crossed the uncertain but ever-present threshold of one Spanish meal time into another they were generous with their time and hospitality. The food we found in Valencia held its own, but apart from the local specialty, Paella, it was very standard Spanish fare. I can’t get enough jamon bellota, bocarones, calameres, patatas bravas or morcilla, not to mention paella or those wonderful Spanish salads which are always topped with meat of some kind, but something inside me sensed there was more to try and I felt I was falling short of the best food in Valencia. One of the issues of being American in Spain is understanding how meal times work. Madrid is very cosmopolitan and many of its restaurants morph their hours to fit into the more northern concept of three meals a day while also observing Spanish meal times. San Sebastian, where I have eaten at least one of the best meals of my life, is like many tourist cities and seems to have day long dining with Spanish mealtime influences. Valencia, however, is totally Spanish old school when it comes to meal times. There are four meals a day with four distinctive, yet overlapping, types of food: desyuno, coffee and pastries in the morning – don’t even think of eggs for breakfast, then bocadillas (sandwiches), eggs, salads and tapas in the late morning, next is la comida – the family meal – with roasts, steaks, paella, big food in the afternoon, and finally la cena at night which can be tapas or another big meal. As the week progresses la cena gets a little bigger until Friday & Saturday where it is the big meal, but on Sunday the big meal goes back to la comida. Add to this the fact that few restaurants post their hours, and many restaurants open when they are ready and close when they want, and timing your restaurant meals with your American appetite and lifestyle takes practice. 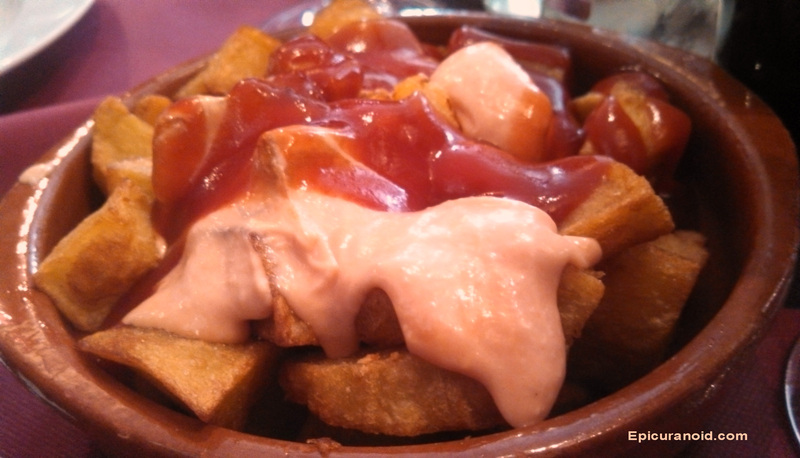 The days when you successfully slip into the groove of Spanish meal times are the days when the eating is the best. We usually hit some days and miss others. Incorporating the full concept of siesta, which is a mid-day break or resting time after la comida, is nearly essential to the pattern of Spanish eating. It is hard to come from the west and adapt to siesta, especially when living with teenagers who like to sleep in. We missed more than one great dining opportunity due to timing. Yet even the ones we hit and loved, Paella at El Rall, the international fusion at Basilico and the tapas we kept returning for at Purisima were driving my desire for something more. While in Valencia I made a friend at my favorite charcuterie shop, who I visited often to keep fresh jamon bellota, chorizo and salchicas on hand for those days when we couldn’t catch the Spanish meal times. His name is Salvador and after a couple of visits he started to understand my Spanish, or he overcame it, and we started to communicate, a little. Even though my visits were early in the morning, he was fond of offering me samples of meats and cheese followed by small glasses of wine. I learned he was originally from Madrid, and we talked about the culinary differences between Valencia and Madrid. We talked about San Sebastian and the Basque country and agreed they had the best food in the world. I found his jamon bolleta to be superior to most and I asked him where the meat came from. He said he now lived in a little city outside of Valencia where his charcuterie and wine came from; he was the vendor, not the maker. 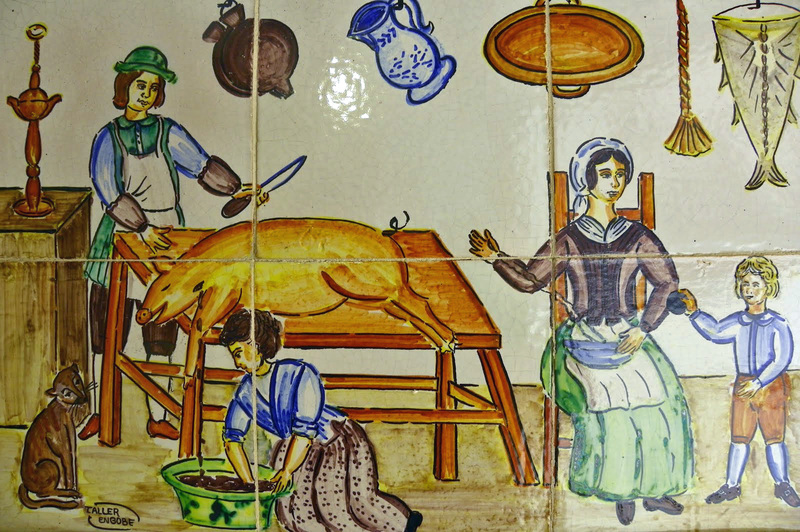 When I asked him if it was Requena, he became animated, no, he was not from Requena, but he said the best food and sausage in Valencia Country came from Requena, “La matanza” he said, and he shook his head in the wistful way of someone who was humbled. “Ah, la matanza” I said, as if I understood him, but I didn’t. Y el dia de la matanza. La matanza is the pig killing day, the slaughter. Historically one of the most celebrated days for the people of rural Spain. It is a day families, friends and villages came together to celebrate the present and preserve for the future. The nostalgia the Spanish have for la matanza reflects the preeminence of the pig in their life and culture. Requena maintains its connection to la matanza in ways I don’t know. However, I do understand that one way is how the quality of Requena’s embutido, or sausage, production is carefully regulated. 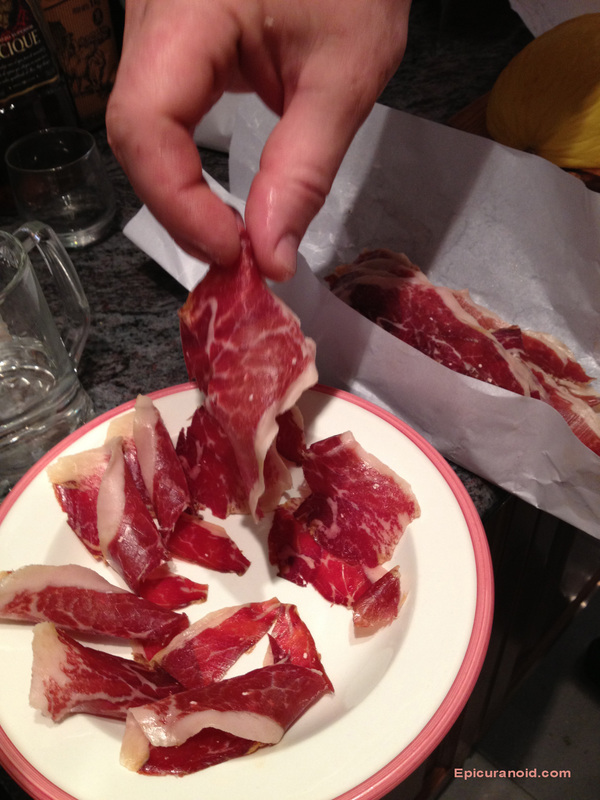 Authentic “Embutidos de Requena” must meet stringent regulations. Pigs must be local sows or castrated males of a certain age, only natural casings and products can go into the sausage, and only top quality ingredients are allowed. Beyond the laws, the sausage makers focus on traditional local recipes, fitting the proper sausage to specific cuts of meats and types of fat. Speaking a language is different than understanding a language, knowing what la matanza meant was different than understanding what it meant. I knew somehow that la matanza is what drew me to Requena, though I still don’t know la matanza, nor do I fully comprehend how it permeates Spanish culture, but I’m willing to learn. On our last Saturday in Valencia we tried to take the high speed train to Requena, but the hours were wrong and the price was high. On the advice of the information center at the train station we found ourselves instead waiting at a bus stop for a bus that never came. Saddened, we settled for the Bioparque, which made an excellent distraction. That night, like the train and the bus, we missed la cena because our meal schedule was out of sync. We settled for pizza, olives and jamon at home, no Requena, no grand Saturday night meal in a restaurant. Two days left in Spain and feeling defeated by the local transportation schedules, Requena seemed further away than ever. On Sunday morning the Yank in me took over. I busted out of bed, walked to the train station, and rented a car for about a half the cost of 4 high speed train tickets. So at 11:30 AM, as we passed through the final kilometers on a country road to Requena in our Opal, history lessons over, Spanish highways conquered, I already had a feeling of satisfaction with our day. 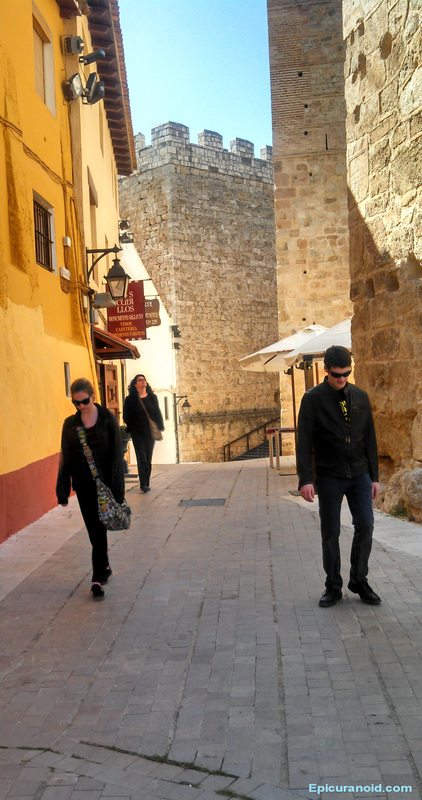 The town itself sprawls out around La Villa, and we parked along the paseo that runs through the center of town. It ran about 6 blocks, East to West, lined with shops and bars. Avenue de Arrabal or avenue of trees is two one way streets flanking the median walking park or paseo. That median was filled with tables and umbrellas, people in their Sunday clothes, children running and playing, old men walking their little dogs; it was all very Spanish Sunday afternoon. We needed to use a restroom after the ride, so we walked up and down the paseo looking for open chairs. It would be rude to simply use a bar’s facilities without patronizing it. There were more than 50 tables for a dozen bars and cafes. They were mostly full and it took us a half an hour to get one. As we sipped beer and wine, and Fanta naranja, we watched the tables begin to empty out. I was glad we didn’t come on Saturday for the market and the tourists. The scene along the paseo was calming, peaceful, and homey in a foreign way. After one drink we left to find La Villa and a restaurant. Near the West end of the paseo a narrow road circled up, not so gently, into the ancient little town. Buildings, mostly homes, of several stories were built on top and out of other buildings. It was beautiful. Some places like this would make themselves up for tourists like a lady going out on the town. 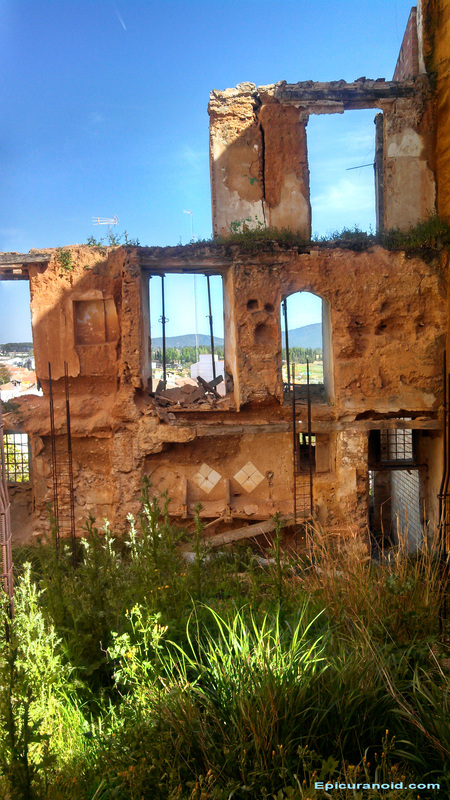 Not Requena, it is real, it is raw, but not pretty, just beautiful. Earthy buff and caramel colored layers of plaster and paint flaked off of most buildings. Plain masonry walls crowded into others with gothic reliefs that spoke through the ages. Coats of arms were cast into stone above doors wearing ornate hand wrought knockers. It was Arabic, it was Spanish, it was so damn authentic that around every corner we expected to see Anthony Bourdain and a camera crew. When we got to the very top there was a small village square with a fountain, on one side was a hotel with a small cafe, on the other our destination, the restaurant Meson La Villa. A flush of sadness took me when I saw how packed they were. We were toward the end of la comida, just a little before 2:00 PM. I walked around the full outside dining area and squeezed into the doorway. Only one table smack in the center of the tiny dining room was empty. It sported a reservada sign. A tall and pleasingly handsome waiter asked me how many in my party. I told him there were four and he asked me to wait outside for a minute. I watched through the doorway as he conferred with the other server, an equally tall and attractive woman, they looked around the room. At one point he left, looked outside at the guests, and returned to her. They picked up the sign and he waved me in. As a restaurateur I knew what had happened, they reserved tables to make sure that their local clientele could be seated before tourists. They had determined that it was late enough to give it up, or all the key guests were present. We were lucky. The house red was the local and highly acclaimed Murviedro Crienza, a well-balanced blend of Tempranillo, Monastrell and Syrah. It made a fabulous table wine, almost bold, smooth, gently but distinctly tannin. The four of us enjoyed a bottle while we read the menu. This led to a shared salad, superbly balanced with several lettuces and radicchio, garden tomatoes, walnuts, goji berries, and a tart lime colored glaze, painted out on the rim of the plate to let you know that their traditional menus and foods would not be restricted from modern techniques. They brought us a sweet vinegar and the waiter produced a bottle of Vallejo de Lazaro Extra Virgin Olive oil. He explained it was local and superb oil for our bread and salad, “muy especial” he said “muy bueno”. We agreed. Like all good restaurants we didn’t have one server, we had them all, the woman had taken the lead, but both floor servers and the bartender made sure all of our needs were met. After salad and bread we created a shared soup course with the Gazpacho Manchego. The Valencia Country is known for its Gazpacho Manchego and I was glad to find it on the menu at Meson. Typically it is an entree, and it took some explaining, mostly due to poor Spanish on my part, to get them to bring it as an appetizer course. It is a very hearty “Hunters Stew” usually made from rabbit stock with game birds (grouse), rabbit, hare, and often domestic poultry. The Spanish consider it a soup made with the “minor” game animals, but it often contains beef or pork and or stock from beef as well as or instead of the rabbit stock. It has some tomatoes, but is entirely unlike the cold Gazpacho Andaluz — the fresh tomato soup we Americans think of when we hear gazpacho. Ours had no mushrooms, but I understand wild mushrooms are also a staple. 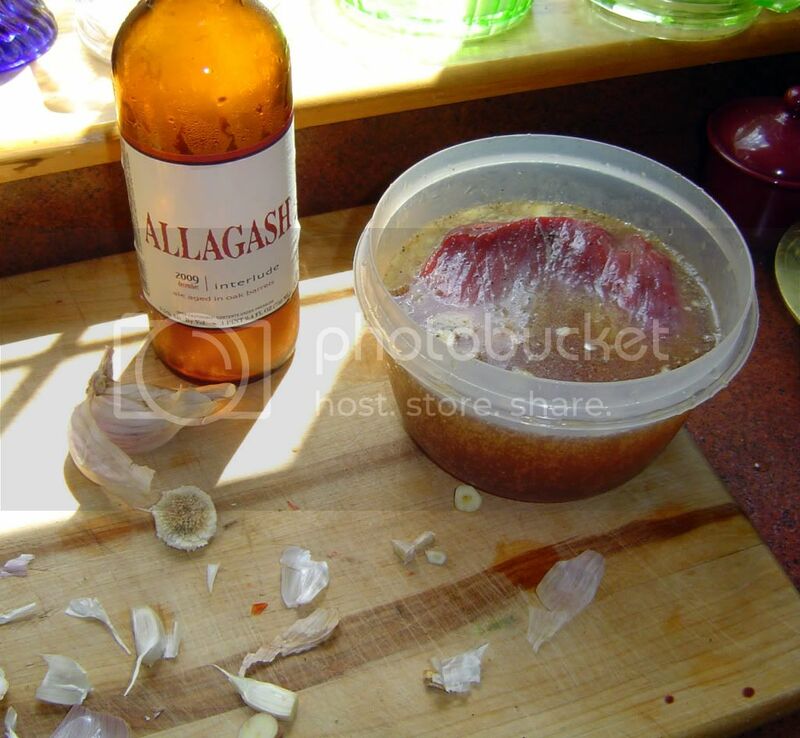 It is seasoned with salt, pepper, bay and thyme and has plenty of onion and garlic. 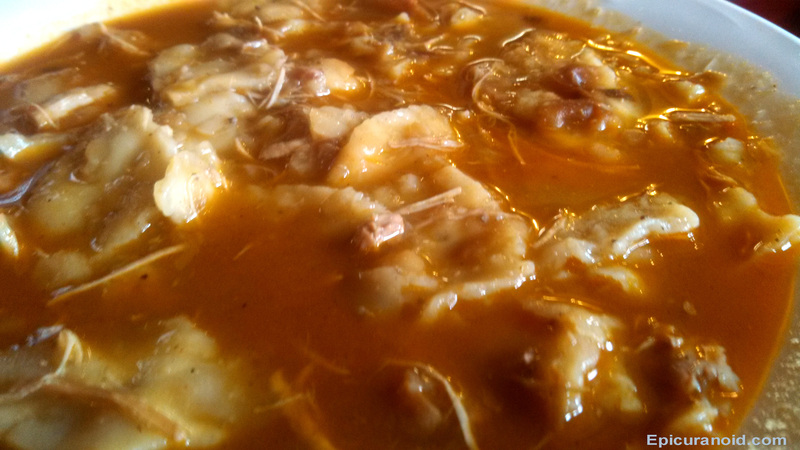 The most unique aspect of this soup is the torta de pan or torta gazpacho, which is often translated as a “cake”, but is actually just a simple unleavened flatbread that is cooked in the soup like a dumpling. Technically, I would say they are noodles, as in our case the torta de pan was not unlike a simple handmade pappardelle. Often the soup itself is served in a cooked focaccia-like flat bread, ours was not. This soup was maybe the best tasting thing I had eaten on this visit to Valencia. It was intensely satisfying, rich in flavor, subtle in seasoning; the torta made for some nice bulk and had wonderful texture. I did not ask what specifically was in it, but it was one of those simple culinary masterpieces created from the proper balance of a few delicious ingredients and good technique. Four of us shared one bowl of gazpacho and we understood why it was intended to be an entree. By now we needed more wine. The entrees came, four sausages sampling three local embutido styles, bacalao (cod) with roasted pepper and almond sauce, and grilled pork cutlets, steak tenderloin from a fully grown steer (carne de buay, in Spain these things matter as beef can be ternera from a young cow or steer, vaca from a cow and often an old dairy cow, or buay from a bull or ox, ox being a castrated bull or a steer that is fully grown). We shared and enjoyed them together, though the cod was mine, my wife had the sausages, my daughter, the simple grilled pork, and my son the steak with a creamy sauce. 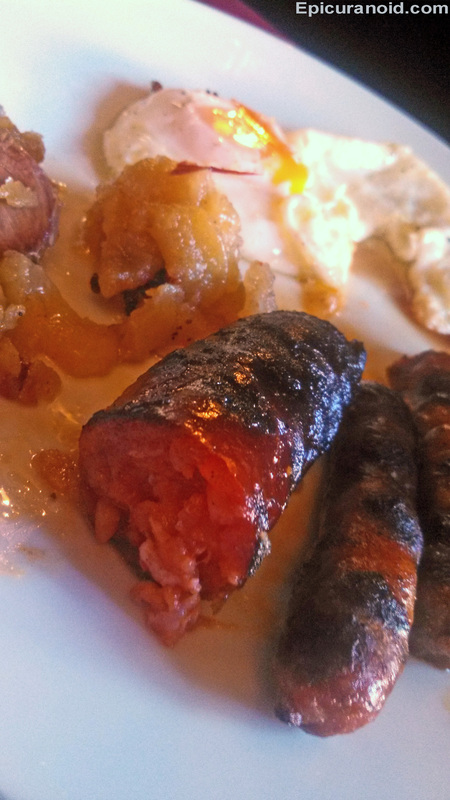 The embutidos were memorable, each one distinct, one like a breakfast sausage, one having a distinctly sweet, maybe fruity flavor, one spicy, all heavily grilled outside yet soft in the middle, very jucy and slightly underdone — which is common with fresh sausage in Spain. They were served with a perfectly cooked egg on the plate which thrilled me as this had not been the custom with most of our meals in Valencia, though it had been so in Madrid. 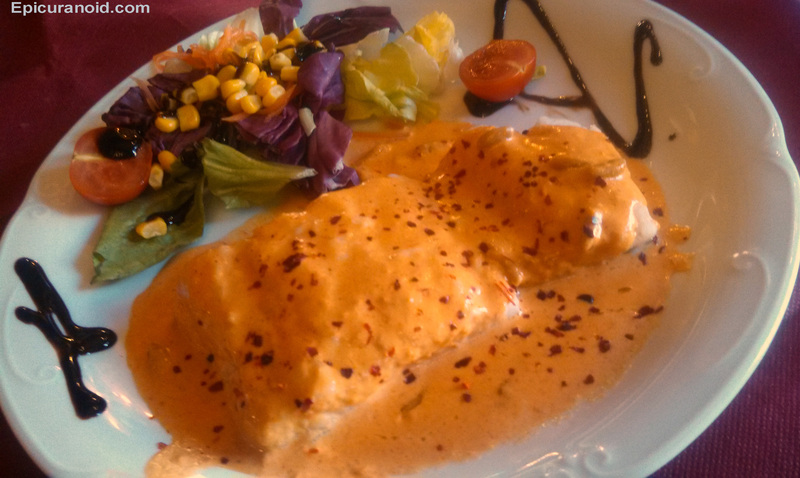 The perfectly cooked cod had a delicious red pepper sauce with a fresh salad accompaniment and a fun glaze on the plate. The steak was delicious and subtle, not rich, and the pork was delicious, tender and succulent. We then asked our servers to pick us two desserts which turned into quite a scene. Before we knew it they had dragged out the chef, and she, the two servers, and the bartender stood around our table discussing what should be brought. By now almost all of the tables were empty; only two gentlemen lingered over glasses of white wine in the table to our right. The mood had become casual and fun like the end of a big family gathering. 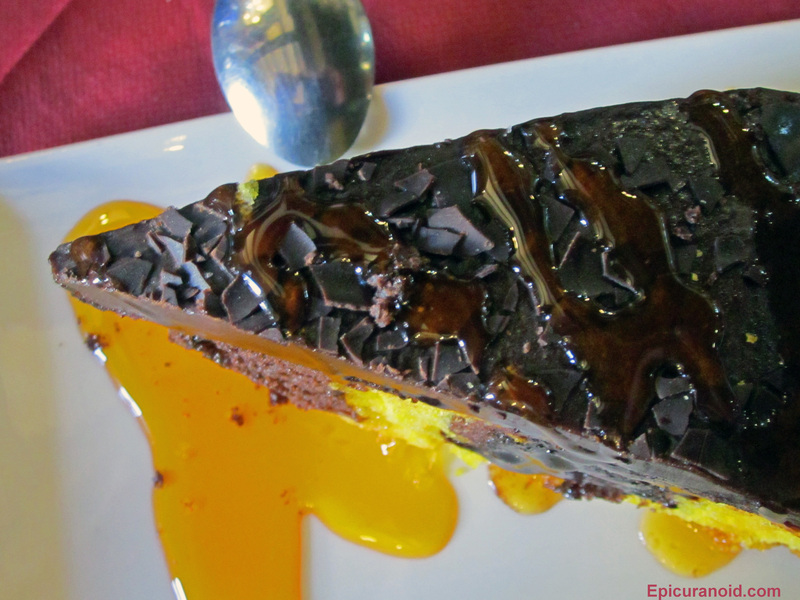 Eventually the four staff members agreed on a chocolate torte served with vanilla ice cream and chocolate sauce, and an orange and chocolate cake with ganache, topped with orange glaze and chocolate flakes. Our only advice, “Nos gusta chocolate,” (we like chocolate) was not lost on them. The pictures I have posted of this meal look tasty, but the meal itself was extraordinary. I tried to explain how much we enjoyed it to our servers and they didn’t really understand. As always we over tipped; but this time we had no guilt whatsoever in doing so. That afternoon La Villa was an ideal place to walk off a few glasses of wine. We walked past the gothic churches, the palace, the ruins, the citadel, on and on through the narrow streets while the children played in the few slivers of yard they could find, the couples walked hand in hand, and the old men walked their little dogs. We finally wound our way back to the paseo and back to the very bar we had first visited. The streets were empty now; most of the tables had been taken in. We stopped for coffee, needing a little more time before driving and the use of the restroom again. The trip back to Valencia city was like rewinding a movie. The excitement dissipating as we reached the end which was actually the beginning. 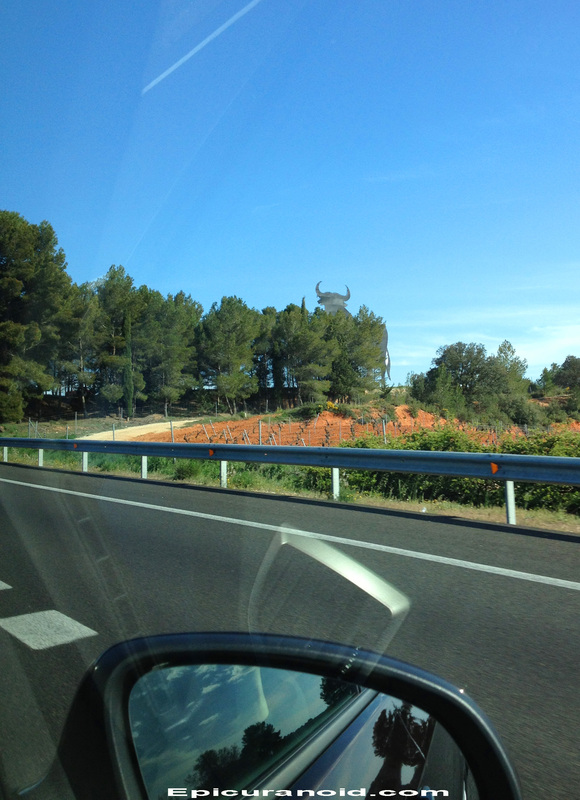 We had taken a vacation within our vacation and we had been enriched and surfeit by our quick trip to Requena. And the day of the slaughter. All other pictures by Epicuranoid. Superb piece. Felt like I was there.